Former Newcastle, Birmingham and Norwich manager Chris Hughton says he is interested in the vacant managerial post at Brighton & Hove Albion. 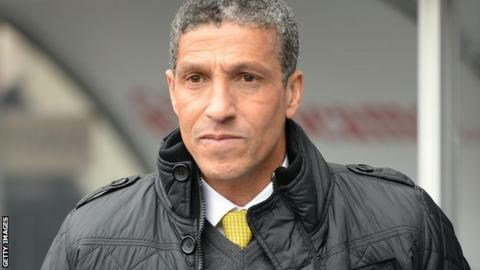 The 56-year-old, who was dismissed by the Canaries in April, is understood to have held talks with the Seagulls. Hughton also said he would "absolutely" be interested in the job at West Brom following Alan Irvine's sacking by the Premier League club on Monday. However, BBC Sport has learned that the Baggies are already in talks with Tony Pulis and Tim Sherwood about replacing Irvine. "As a manager that wants to get back in, it is about getting in at the right place." Sami Hyypia resigned as Brighton boss on 22 December following a run of one win in 18 league games, but the Championship strugglers have since picked up four points in two games under caretaker manager Nathan Jones. "I was asked to take one game and then it developed into two," Jones told BBC Sussex after Albion's 2-0 win at Fulham on Monday night. "I've been here as a player when we've had good times and when we've had iffy times and come through it. It is an outstanding club with good people involved." Meanwhile, Hughton has ruled out a return to former club Newcastle, with Alan Pardew set to leave the Magpies to join Crystal Palace. The ex-Tottenham and Republic of Ireland full-back was sacked by Newcastle midway through the 2010-11 campaign, having led the Tyneside club to promotion from the Championship the previous season. "Most people are aware about the way I left the club," he said. "I had three happy years there and you have seen in Alan's tenure there the ups and downs you can go through. "At this particular time, I think there are a few vacancies. As a manager that wants to get back in, it is about getting in at the right place."